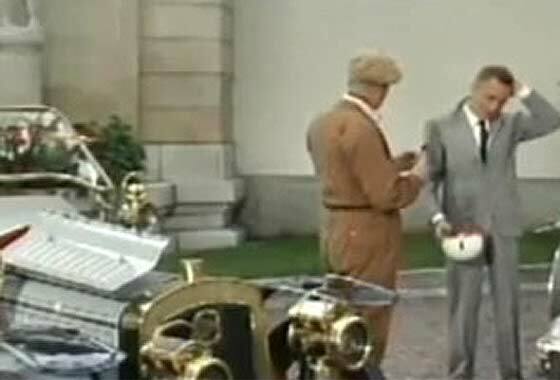 Cinema screen grab taken from an American MGM film " Count Your Blessings" made in 1959 where cars are being investigated by IMCDB. Book by Nancy Mitford. Stars include Deborah Kerr and Maurice Chevallier. 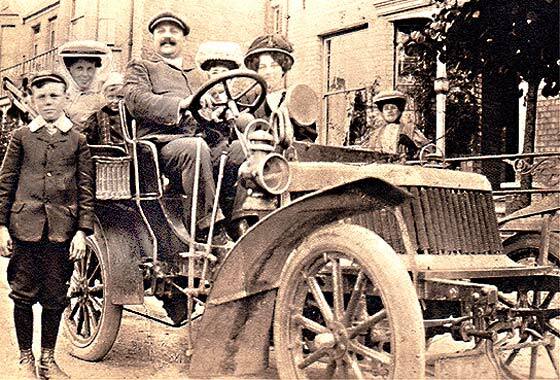 Story about a couple who marry before the war, hubby goes off to fight and gets shot, returning eight years later... -- No front to speak of, engine at the back, steering wheel rather than rudder, this a French cca 1899 Clement Voiturette with de Dion Bouton 2.75hp engine. 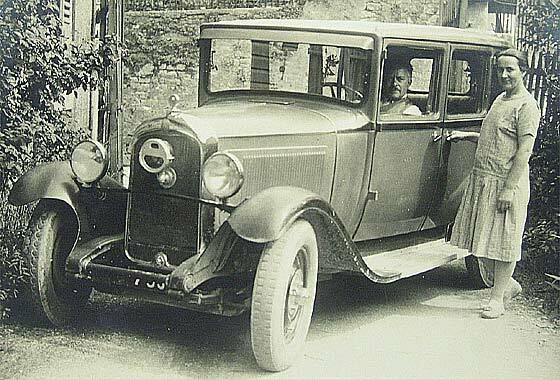 Lovely period photo received from Reg Towner (UK) of a car reputed first vehicle in Newhaven, Sussex. 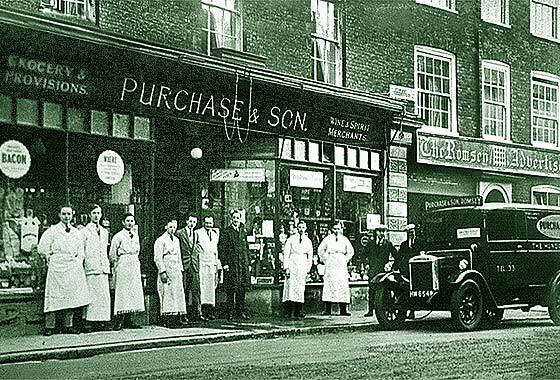 It was owned by his family, skilled engineers and owners of town brewery and fourteen pubs. 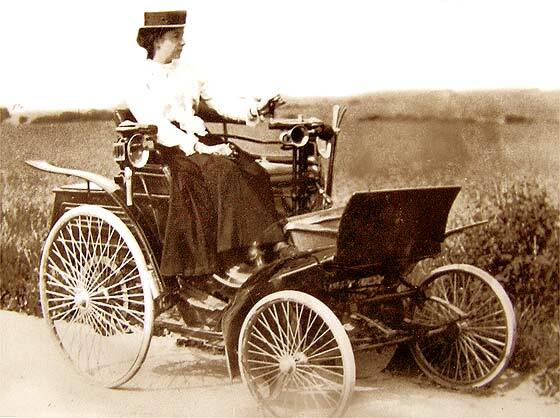 Photo is marked "Mother and our Mercedes Benz, 1901". 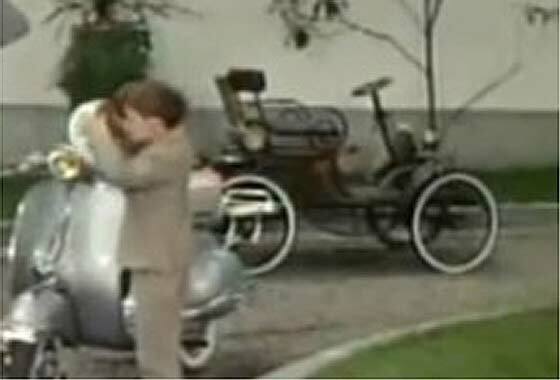 Believed a "Benz Velo" or "Benz Comfortable" (too early to be a "Mercedes").-- (M-B merger was in 1926!) This is a cca 1900 Benz Velociped Comfortable. There were four engine sizes 1.5, 2.75, 3, 3.5 HP. 1,200 off Velos made 1894-1901. Period photo received from Steve Bradley (UK) sent on behalf of Aleck Stacey, the Grandson of Aleck Stacey who later became Mayor of High Wycombe. Possibly the first car in High Wycombe? 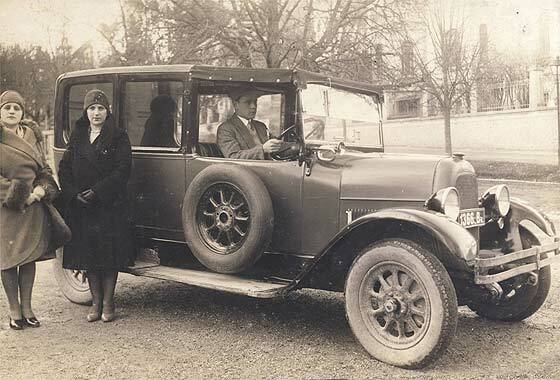 Any help to identify the car would be much appreciated. -- Scottish car built in Bridgetown Glasgow by company founded 1899 as Hozier. No numberplate clear, suggesting made and photographed pre 1904. Radiator was used for couple of years so has to be a cca 1902 Argyll Rear Entrance Tonneau. Cinema screen grab taken from a n American MGM film " Count Your Blessings" made in 1959 where cars are being investigated by IMCDB. Book by Nancy Mitford. Stars include Deborah Kerr and Maurice Chevallier. Story about a couple who marry before the war, hubby goes off to fight and gets shot, returning eight years later... -- Made by one of the earliest of car makers, starting in 1894, this is a French c1905 Delahaye Type 37 Tourer. Joined Hotchkiss in 1954, and was gone 1956. 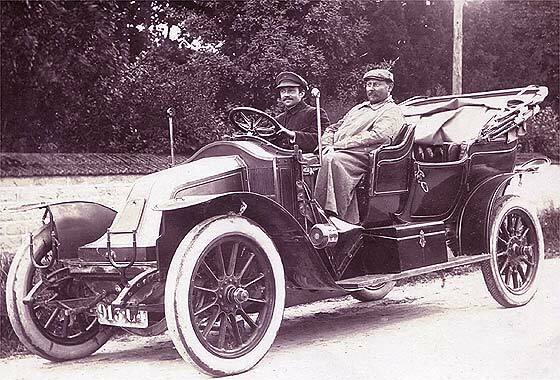 Lovely photo received from John Allen (UK) of a French registered Chalon-sur-Saone car post 1905 but pre-1928. Noted dashboard radiators on CGVs and Charrons but no match. Understand that Renault also made such cars? -- From the wheelhubs and the shape of radiator we can confirm that this is a big Renault. They then made numerous sizes /models of cars so identification is difficult but has a flap on the bonnet suggesting latest cca 1908 Renault Roi des Belges, 20 or 35 HP. 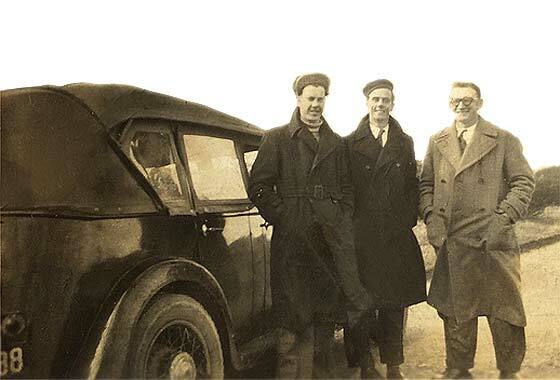 Photograph posted on the PreWarCar website by Tim Crooke asking if anybody can identify the mystery car at Great Grandparents wedding day in Ireland. -- No registration visible to aid in accurate dating but we are relatively sure this is a cca 1908 Humber 10'12 Swing Seat Tonneau. Tonneaus were normally rear entrance where there was a door in the rear. On this one a side handle is visible where there is no space for a door, but the front passenger seat swings out to get in. 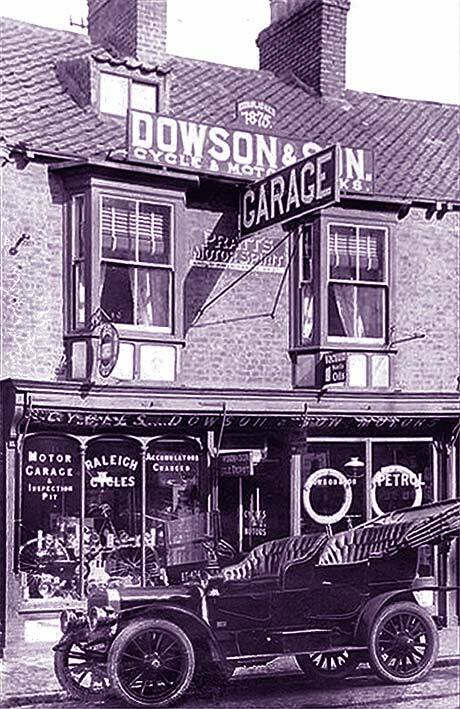 Lovely period photo supplied by a newly discovered cousin of Stewart Would (UK) of a car standing in front of the garage in Middle Street, North Driffield, East Yorkshire, belonging to distant cousin George Appleby DOWSON, an Engine Maker/Cycle Engineer/Steam Engine Maker/Motor Engineer, 1875. -- Confirmed by one of our wise sages as a Scottish made cca 1908 Argyll 14'16 Tourer. Registration BT 474 was from East Yorks CC and same source believes that the car has survived. Lovely photo received from Dennis v/d Meulen (Holland) saying" I'm so glad I found a proper place to indentify the vehicle. Put on license (B-392) on 12-June-1909 in The Netherlands. -- Thank you for the vote of confidence. The car is a German Frankfurt made Adler. They started 1902 and made many models in the early years some of which used De Dion Bouton engines. 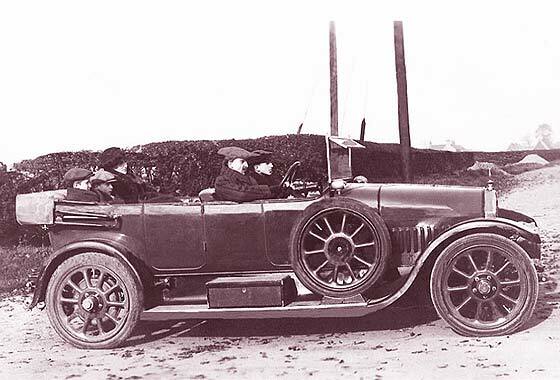 This is relatively light car with later curved scuttle very similar to a surviving circa 1910 Adler 5'11 PS Doppelphaeton. Another period photo received from Dr Steve Bradley (UK) sent on behalf of Aleck Stacey, the Grandson of Aleck Stacey who later became Mayor of High Wycombe. 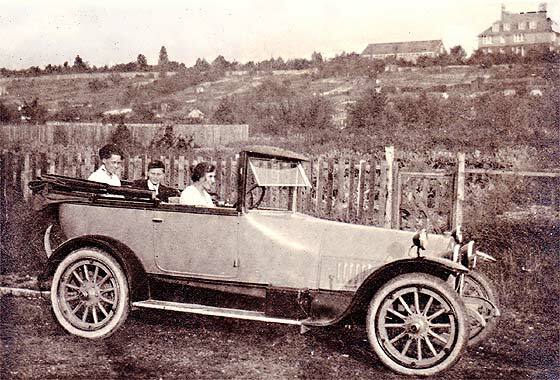 In about 1920 Aleck Stacey had another car. 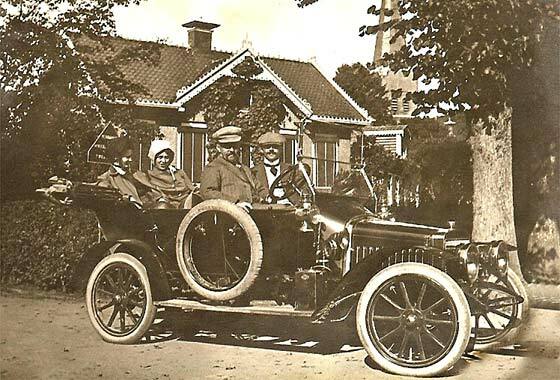 Any help to identify the car would be much appreciated. -- American car with rather interesting coachwork, possibly British. Roof seems 'convertible', but 'all weather' when closed. Louvre pattern suggests a cca 1918 Buick Two-Door Coupe, D or E 46 type, with RHD 4 seat body. Interesting photo received from Stewart Would (UK) taken by RT Watson of Anlaby Road, Hull, somewhere in the immediate Hull area; probably in the vicinity of the village of Swanland. Can we help with the identification of this car? -- Quite a big and long car car with a wide gap between the doors. Couple of our experts agree the car is British and a Humber. 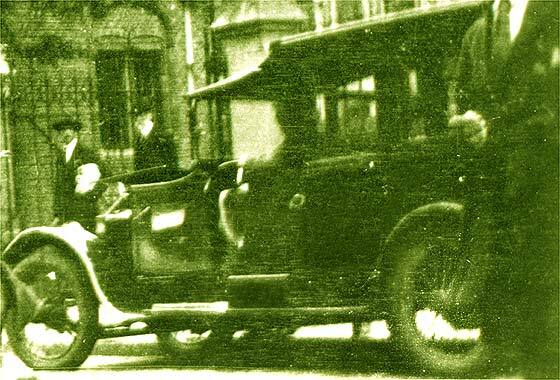 Our Tony Oakes notes no front brakes and no driver's door, which suggests this is probably a cca 1922 Humber 15.9, 5 Seat Tourer. 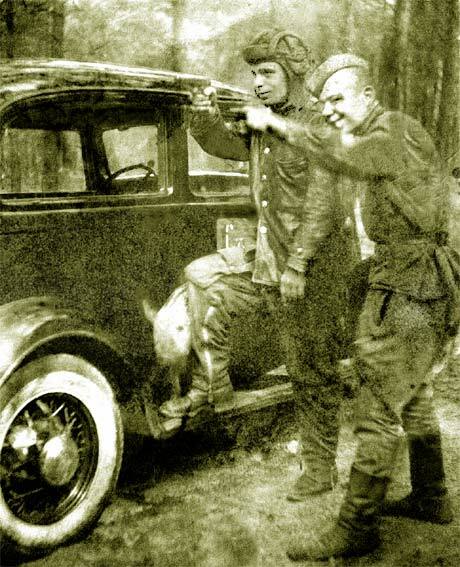 One of a number of interesting photos sent to us by Andrew Kostin from Moscow (Russia) who is a collector of old photos. 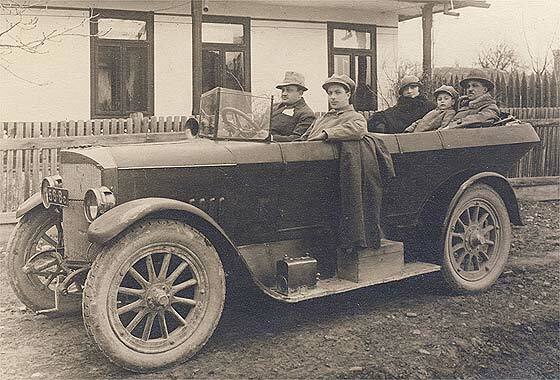 Can we identify this photo of a vehicle taken in August 1928 in Belgium? -- This is a very poor grainy photo which does not reveal much when magnified. In addition the near front door is open as is the bonnet, hiding almost everything. So it is a bit of an 'educated guess' but from rad shape and wheels I think it is a cca 1924 Rolls Royce 20HP Open Drive Limousine. 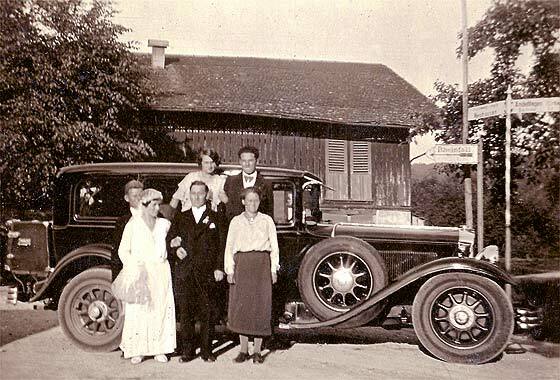 Period photo received from Marcel Leuenberger, Tigard (USA) of a vintage vehicle which was taken in Switzerland at a wedding of one of his ancestors. He is trying to find out the age of the photo; is it 1920 or so?-- 'Rheinfall' on the signpost is on the Rhine in north Swtzerland, and is the largest plain waterfall in Europe. The car is of German origin, from Zwickau. This is a cca 1929 Horch 350 16'80 Limousine. May have later front bumper of a 375. Company became Auto Union in 1932, then Audi. 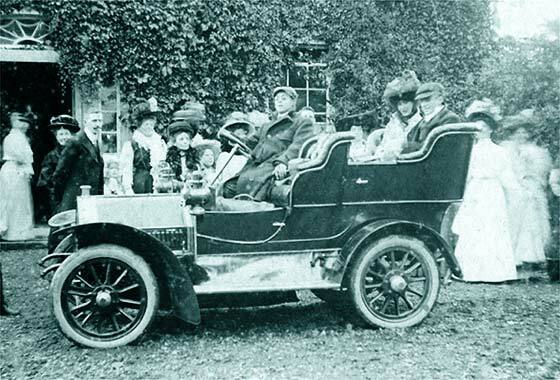 Period photo sent to us by Simon Humber, Wincanton, Somerset (UK) which appeared on the Romsey Revisited Facebook page, but he is having trouble identifying the vehicle. Can we help? -- Numberplate is just visible but unclear on the letters; possibly KW (Bradford), or HW (Bristol) or MW (Whilts). The numbers put it into the 1929-1930 band. The vehicle has smallish headlamps on the wings but windows to the cab so is on the change and is a cca 1929 'Morris Commercial' One Ton Van. Surfing through the internet in attempting to identify old vehicles we often come across photographs or old Postcards, including those on Rootschat and those for sale on Ebay, of very interesting ancient machinery which has not yet been identified, so we have a go ! 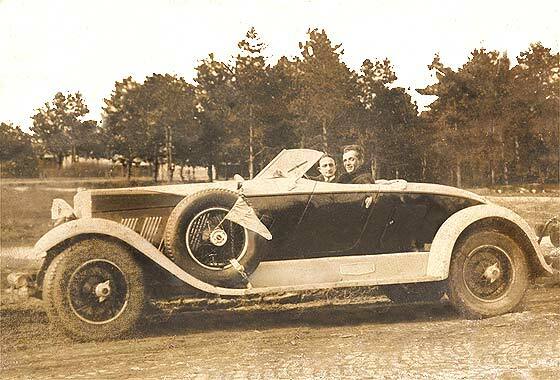 -- French made car launched in 1928 at the Paris Salon and was one of the first with an all steel body in Europe. New range following on the B14 called the AC4, this is a later cca 1930 Citroen C4 De Luxe Saloon, 9CV. Another fascinating photograph from our regular contributor Cicos Florin in Constanta by the Black Sea (Romania) who is interested in old cars of Romania. Do we know what this is? -- Another American car but this one from the supercar stable of Auburn, this being a cca 1930 Auburn 8-125 Boatail Speedster. Errett Cord revialised Auburn and had Russian Count Alexis de Sakhnoffsky design this coachwork. Top of the range, very fast at 108 mph, with Lycoming 125 BHP straight 8 engine. One of a number of interesting photos sent to us by Andrew Kostin from Moscow (Russia) who is a collector of old photos. Can we identify this photo of a captured vehicle taken near Khalkin Gol in 1939 after Soviet victory over Japanese. -- Very poor photo which we have tried to repair and enhance. Noticeable gap between bonnet and rad. Our Mark Dawber thinks is an American cca 1933 Ford DeLuxe Roadster (from curved bonnet louvres), with grafted '37 Dodge grille and wheels. Cinema screen grab taken from a French spy film " Qui êtes-vous, Monsieur Sorge" (Who are you, Monsieur Sorge?) made in 1961 where cars are being investigated by IMCDB. Film based on fact, is about a Russian spy from the Ramsay network in Tokyo Japan 1937 to 1941 who eventually helped to avoid a Russian defeat by the Germans. 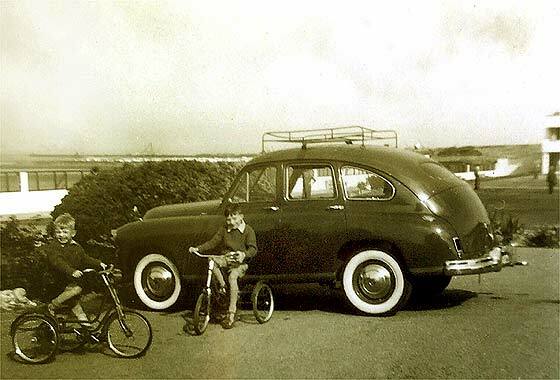 -- American car made by the Chrysler Corporation which has a logo of the ship Mayflower, this one being a cca1937 Plymouth P4 Four Door Sedan. Cinema screen grab taken from a French spy film " Qui êtes-vous, Monsieur Sorge" (Who are you, Monsieur Sorge?) made in 1961 where cars are being investigated by IMCDB. Film based on fact, is about a Russian spy from the Ramsay network in Tokyo Japan 1937 to 1941 who eventually helped to avoid a Russian defeat by the Germans. 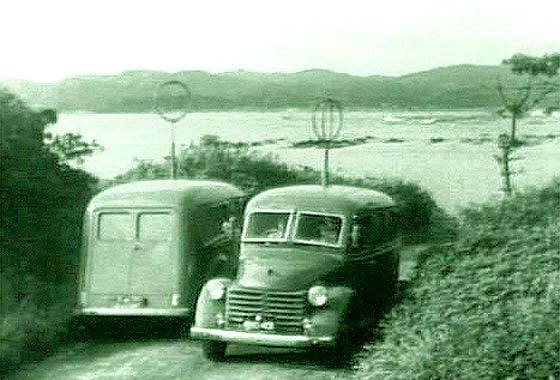 -- Japanese made light van, a cca 1948 Toyopet Model SB manufactured by Toyota Shastai; it had a 995cc 27HP engine also in beetle-like SA car. Photo received from Reg Towner (UK) taken in Morecambe, Lancashire in 1958. The mystery car has split windscreen, whitewalls, 4 doors & chrome rear bumper. 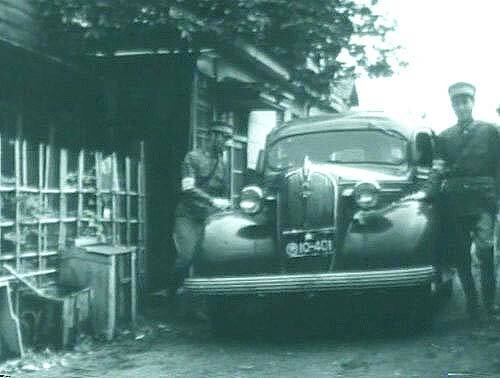 Assumed 1940s Oldsmobile or Buick but cannot find exact match. -- Looking on the wrong continent. This is a British car resembling a US Plymouth and Russian GAZ. 175,000 made in Coventry. It has no rear wheel spats (from '50), narrow rear window (to '52) it is very latest a cca 1949 Standard Vanguard Saloon Phase1, 2088cc four. Lovely photo submitted by Annika Fuchs (Germany) who is rapidly becoming keen on old cars. She snapped this interesting car on the streets Germany. What is it? -- Unusual little car made by the Hans Glas organisation in Bavaria originally making agricultural machines. Eventually bought by BMW. Over 214,000 Sedans and 66,000 Coupes were built. Very small engines, 245, 293 and 392 as TS 250, TS300 and TS400. 59 mph/95 kph. This one is a cca 1957 Gogomobil TS 250 Coupe. 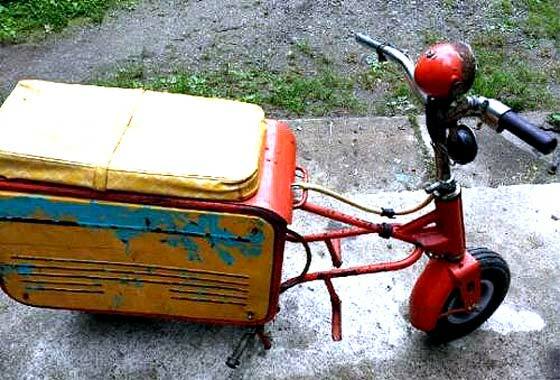 Intriguing photo received from Duke Earl (USA) of a diminutive motor scooter he saw on the internet and wondered what it was? -- New one on us too! 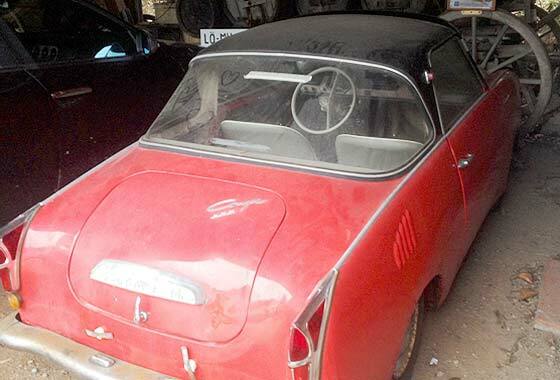 Seems it is a cca 1961 Valmobile, and if in USA then it was probaly made in Japan by Hirano Seisakusho, Tokyo, under licence from the French company Martin Moulet & Cie in Paris. The original came out in 1953 and lasted to 1958. Hirano took over in 1960 for seemingly only one year. Suitcase folding Scooter assembled 30 seconds; 49 to 125 cc. Intriguing photo received from Reg Towner (UK) of a car from family album, likely taken in England "1951", may/may not be 100% accurate. Drophead roof, wire wheels, four doors, perhaps a MG, Morris or Standard but no exact match. -- Difficult to identify as not much visible. Has concealed hinges and rear handles. American? Also has a gap between doors suggesting largish car. Does not seem UK body nor number shape on plate. Mark Dawber suggests Australian Holden body. One of a number of interesting photos sent to us by Andrew Kostin from Moscow (Russia) who is a collector of old photos. 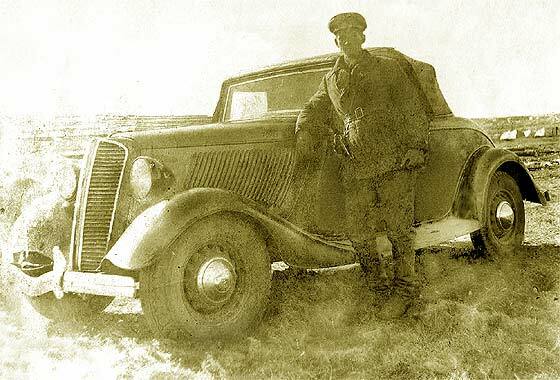 Can we identify this photo of a captured vehicle taken near Khalkin Gol in 1939 after Soviet victory over Japanese. -- Poor photo which we have tried to repair and enhance, but still very unclear! Our Mark Dawber after some hours thinks a low price car from c1932. Suicide front door limits choice and external door hinges; could be cca 1932 Essex Six Two Door Sedan? Another fascinating photograph from our regular contributor Cicos Florin in Constanta by the Black Sea (Romania) who is interested in old cars of Romania. Do we know what this is? -- Lots of our experts have had a go at this one but nobody is entirely sure. It has the Teutonic spitzkuhler radiator but it has French Michelin tyres. Notwithstanding, there are a number of pointers which suggest this could be a just pre or post WW1 Benz. This would have been pre the merger with Mercedes.